Canadian writer. Watanna claimed to be half-Japanese, but in fact she was the daughter of Edward Eaton (English landscape painter), who emigrated from England to Canada, and Grace Trefusis, his Chinese wife. Noguchi met Watanna in Chicago in 1900, probably through their mutual friend Frank Putnam. 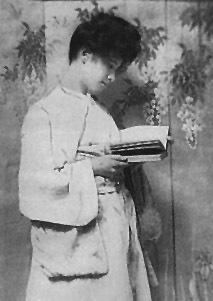 "Onoto Watanna and her Japanese Work" (1908). Image: Current Literature, February 1902.